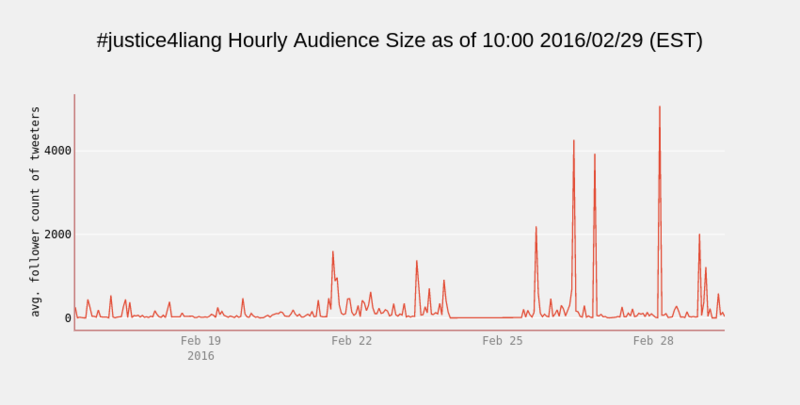 Cosmopolitanvan's interactive graph and data of "#justice4liang Hourly Audience Size as of 10:00 2016/02/29 (EST)" is a line chart, showing follower_per_hr; with avg. follower count of tweeters in the y-axis. The x-axis shows values from 1440388800000 to 1442462400000. The y-axis shows values from -32.55555555555556 to 638.5555555555555.